Imagine seeing the world like you're peering through a rolled-up piece of paper. That's life with glaucoma, a common eye disease that causes tunnel vision, and eventually blindness. Glaucoma is a common eye disease, and the second leading cause of blindness. The disease is characterized by long-term damage to the optic nerve, which transmits visual information from your eye to your brain. It's estimated that 2.2 million Americans have glaucoma, and half of them do not know it. That's because glaucoma is a silent disease. There are many types of glaucoma, and only one type has symptoms. There's no cure, but there are treatments available. dailyRx News spoke with Dr. Christopher Quinn, an expert on eye disease and president of Omni Eye Services in New Jersey, about the current medical understanding of glaucoma, who's at risk and how you can take steps to protect yourself from it. dailyRx: What is glaucoma? What are the two types? Dr. Christopher Quinn: We don't understand what glaucoma is other than a disease of the eye that predominately affects the optic nerve. This disease causes atrophy, or death from the cells that make up the optic nerve on the inside of the eye. We know important risk factors that make people prone to developing glaucoma, but we don't know what it is that causes glaucoma. There are two basic types of glaucoma. First, the most common type is what we call open angle. The second type is closed or narrow angle glaucoma. In case of the closed angle type, it's easier for us to understand what's happening. Fluid which is produced on the inside of the eye travels through the pupil, and then it escapes through the drainage channel in the front corner of the eye. We understand this process. As the fluid is produced at a rate that's equal to fluid being drained, then the eye maintains a normal pressure. That pressure does not cause problems with the optic nerve. In the closed angle type, the angle where the drainage channel is located becomes occluded. When the eye continues to produce fluid, we get a dramatic rise of pressure in the inside of the eye, which causes damage to the optic nerve. The open angle type is more complicated. Patients have high eye pressure despite the fact that the angle is not occluded or blocked. We don't really understand why they have high pressure. To complicate things further, some patients have normal eye pressure, they have an open angle, but they still have damage to the optic nerve. We call this "normal tension" or "normal pressure" angle glaucoma. What do you mean by the pressure in the eye? The eye is a fluid filled organ. Like a tire, it has a certain ideal pressure. If there's too much fluid being produced or inadequate drainage of the fluid, it's like over inflating a tire. So what makes glaucoma, glaucoma? We used to say you had to have three things to have glaucoma. High pressure, loss of visual field, or decrease in side vision, and the way that an optic nerve looks that is consistent with glaucoma. Now, we say you need one of those things. We look at the optic nerve and if we see signs that are characteristic of glaucoma, the patient likely has glaucoma. Number one risk factor is pressure. If you have higher than normal pressure in the eye, that's a risk factor for glaucoma. Secondly, age. the older you are, the greater your risk for developing glaucoma. African Americans are at increased risk of having glaucoma, and Asians are likely to have angle closure type of glaucoma. 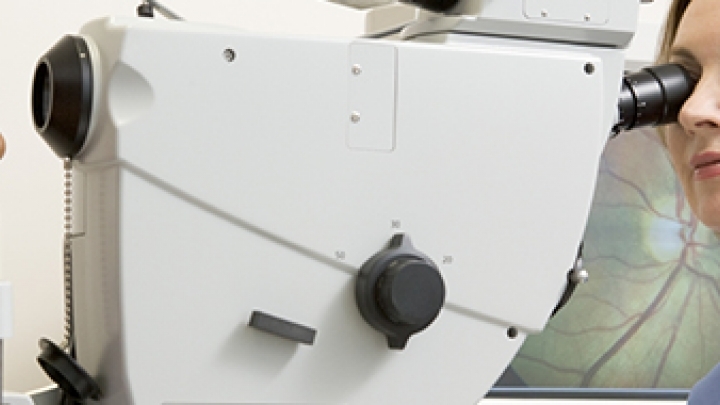 We know patients who are nearsighted or have myopia are at greater risk of developing glaucoma. A family history of glaucoma, particularly in a sibling is a risk factor. The final risk factor, which is relatively new is a thinner than normal cornea. What are the symptoms? How might someone know that they have a problem? That is the big challenge. The patients that have the closed angle type develop redness, pain in the eye and blurry vision. Often times they'll get nauseous. They'll feel generally poor because the pressure goes high. In patients with the open angle it's difficult because it doesn't have any symptoms. You can't feel the pressure going high, and you can't see change in your vision until the disease is advanced. If you're not having your eyes checked, you would have no idea. It's estimated that 50 percent of people who have glaucoma in the United States don't know it. It creates no symptoms at all. When can you not ignore it? Good news about open angle kind of glaucoma is that it typically progresses slowly. So if you don't know about it you might have it for years before it interferes with your vision. That makes it advanced. When we treat glaucoma, we can't reverse damage that's already occurred. The whole idea is to catch it early enough so we can prevent irreversible loss of vision, and treat it early enough. You should have regular routine eye exams. That's your best prevention against unknowingly having glaucoma. Everyone over 40 should have a routine eye examination. The best exam is when the pupils are dilated so we can get a great view of the optic nerve and look for characteristic signs of glaucoma. Since the risk increases with age, certainly by the age of 60, it's a great idea to have an annual eye exam. Is this a risk for people with poor vision or for anyone? When we talk about vision, it's your ability to see letters on an eye chart. That's the last part of the eye that's affected in glaucoma. You could have someone who has severe vision loss from glaucoma, but they could read 20/20. But it's tunnel vision. You lose all peripheral vision. That's why it's dangerous. It might progress at a different rate. You might have advanced damage in one eye and less in the other. You might not notice. By the time you notice a problem it's going to be very advanced. Currently, the only treatment available are techniques to lower the pressure. We know from studies that lowering pressure is a way to slow or halt the progression of glaucoma. We have three ways. We can use medication – eyedrops or pills. We can do laser treatments, which help lower the pressure by increasing the outflow of fluids. Or we can do surgery. Surgery is designed to advance outflow so pressure becomes lower. Typically in this country, that's the progression we have patients go through: medication, laser, and surgery. There are some new things on the horizon which both work to enhance surgery by using little devices to help fluid escape from the eye, and then there's interest in finding medications we can use to protect the nerve against damage. The important public health message is, it's like high blood pressure, it's an asymptomatic disease. It doesn't create an issue. If you don't get checked, you don't know about it. If you have risk factors, those are important things to make sure that you get checked.